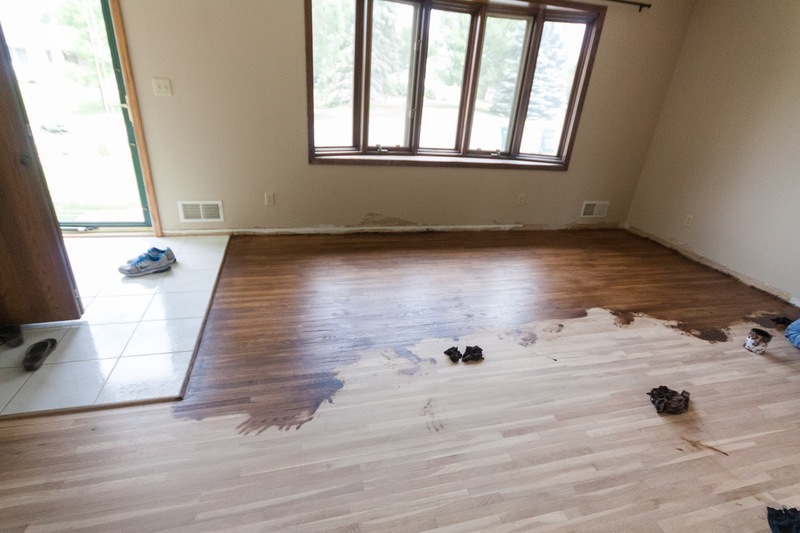 Before we started the floor project, I had a freak out about the stain color. I knew we needed something much darker than what we had, due to the dark casing that I was not going to change. 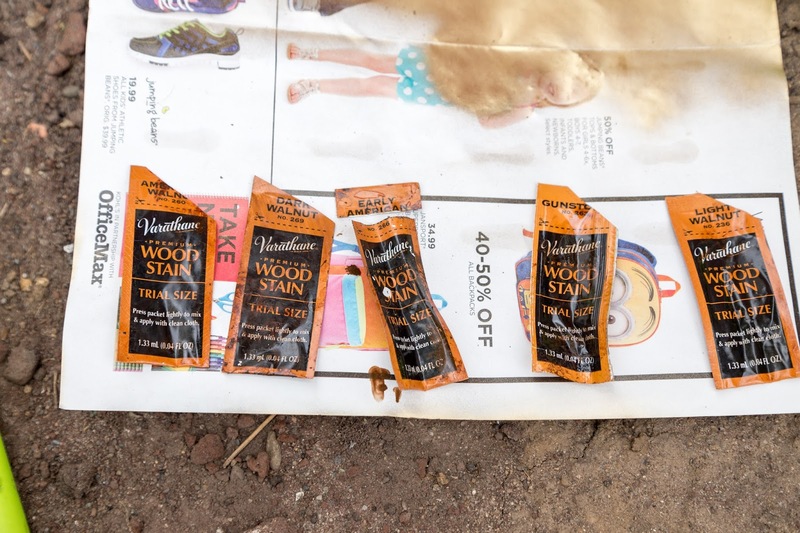 I love that Varathane has tiny little sample packets at Menards, just 30 cents each...a lot better than buying 5 or 6 small cans. Especially because I ended up picking a color I didn't think I would want. 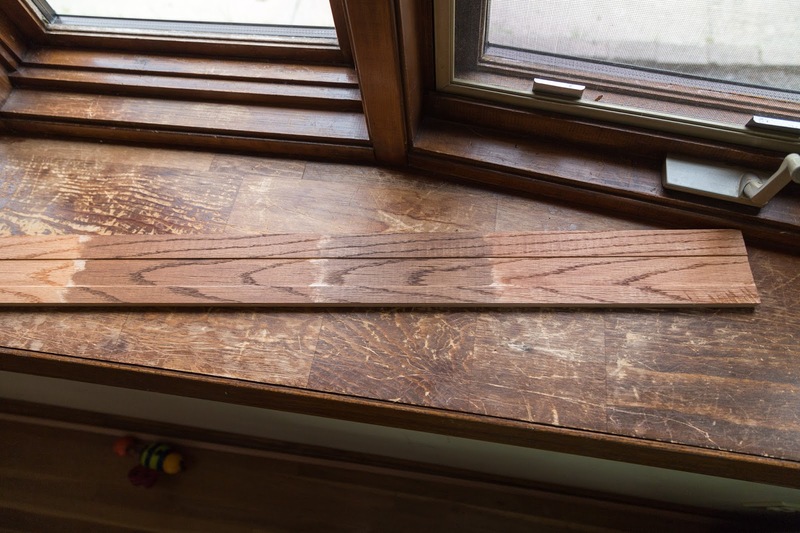 Here are my five choices on a brand new oak baseboard. At first I thought we liked the third one the best (Early American) but then when I brought the board inside, the second color from the end was clearly the best. 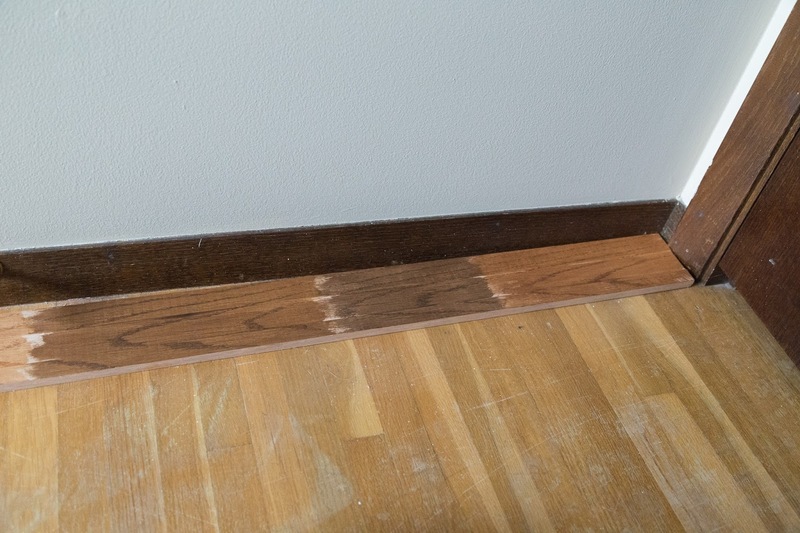 That color was Dark Walnut, which looked so dark and blah on the baseboard. But I knew that when the oil poly went on top, it would warm the color up quite a bit. I also went to a fancy paint place that carries Old Masters stain, I thought the American Walnut I used for our kitchen shelves would be nice, but it turned out super red! I was pretty pissed I wasted 15 bucks on that. Here is the Dark Walnut going on. I just loved that it was dark enough that only one coat is needed. 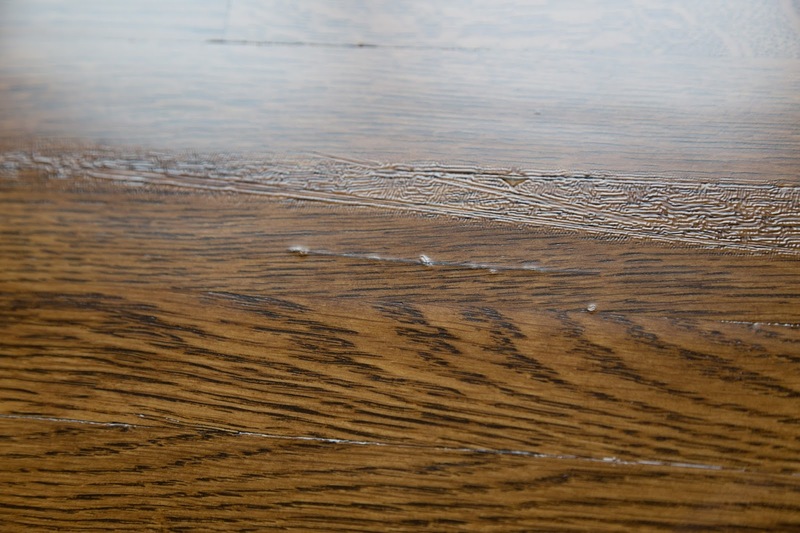 You can do multiple coats, but once the first coat is absorbed, the subsequent coats don't sink in as well. 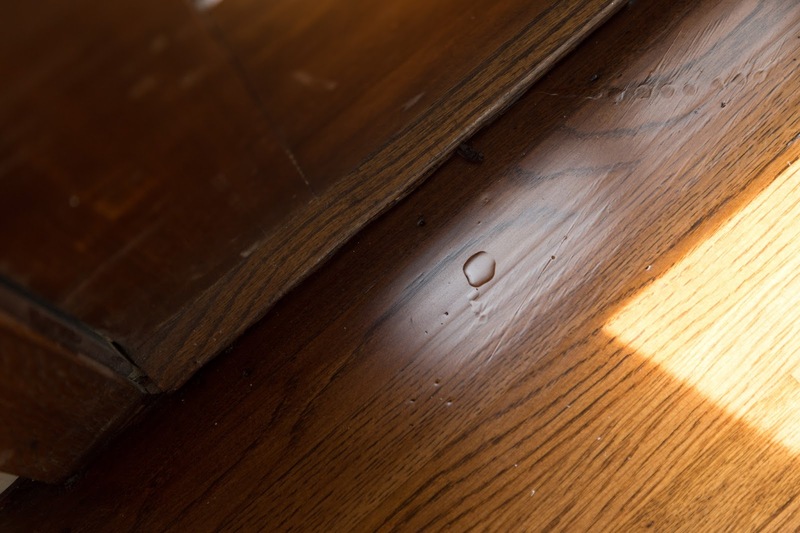 We also wipe the stain off immediately, using a lot of elbow grease, that cuts down on drying time and ensures that you don't have blotches. When we stain, we use cut up t shirts as rags and we wear pants and socks. We also avoid putting our hands right on the floor. 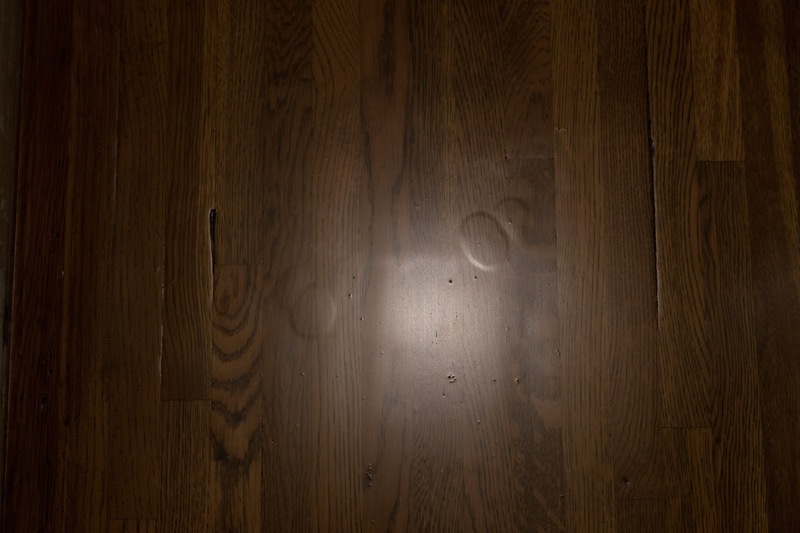 The oils from your skin can create marks (and foot prints!) that show in your stain. 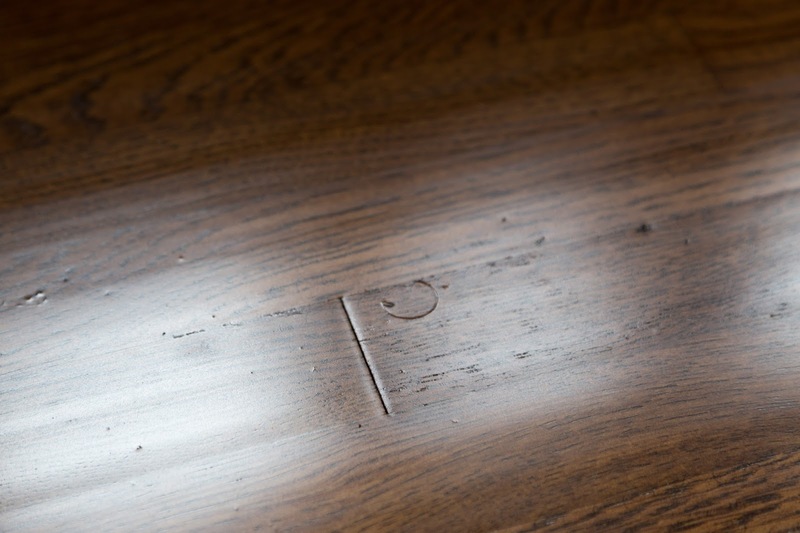 This happened to me when we did Ashford's room two years ago, a foot print right in the middle of the doorway! 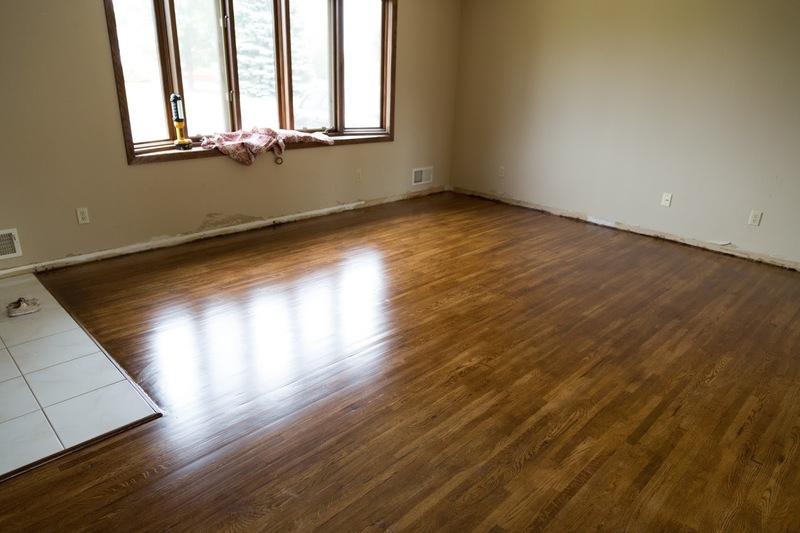 It became apparent to us while refinishing these floors that the quality of the oak was pretty low compared to the red oak floors in our previous house. Since this place was built in 1973, I'm not necessarily surprised the wood is not top quality, but it still sucked. It didn't sand as well, and didn't accept the stain as well, either. But it still looked pretty good when I busted out the poly. 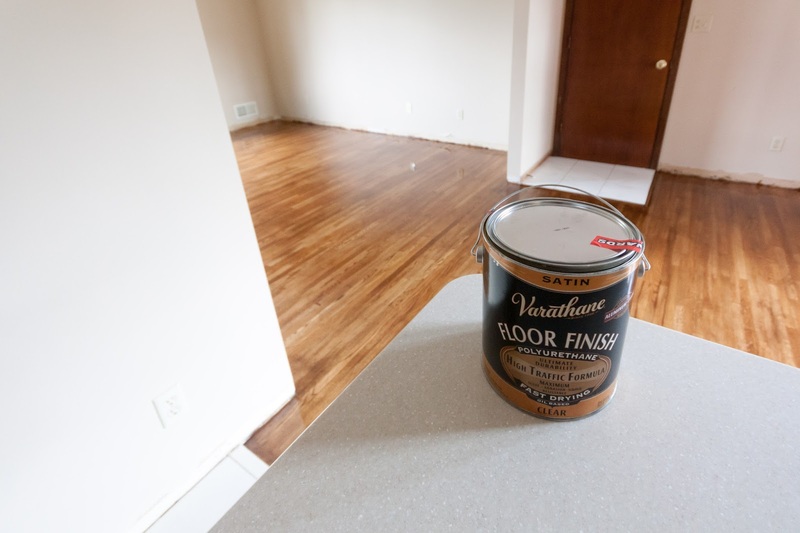 We went with Varathane again, because I am familiar with it and it worked out good in our last house. Ever since our awesome floor guy clued me in to this tip, I've used a regular Shur-Line 9-inch paint pad to put on poly. I only buy one, then I wrap it in plastic wrap and freeze it until I'm ready to do the second and third coats. It works really well! I alternate between using a pole attached to the applicator, and holding it by hand, depending on where I'm at in the room. I still can't believe I totally missed those sections, and also...we got a severe wake-up call about how often you have to stir satin poly to maintain the satin finish. The matte particles will settle at the bottom of the can if you don't stir constantly, and on our third - what we thought was final - coat, most of the upstairs was full gloss! You can see in the above pic the satin below the gloss. I was so disgusted. In the above photo, the gloss started where the window reflection ends. What the heck. Luckily (not luckily, but you know...) I had straight up FALLEN in the third coat of poly in the dining room, so I knew we would have to do a fourth coat, anyway. It was so embarrassing. I flailed around like a fish out of water and Shaun just laughed and laughed about it. Needless to say, we couldn't fix it all the way and had to redo. 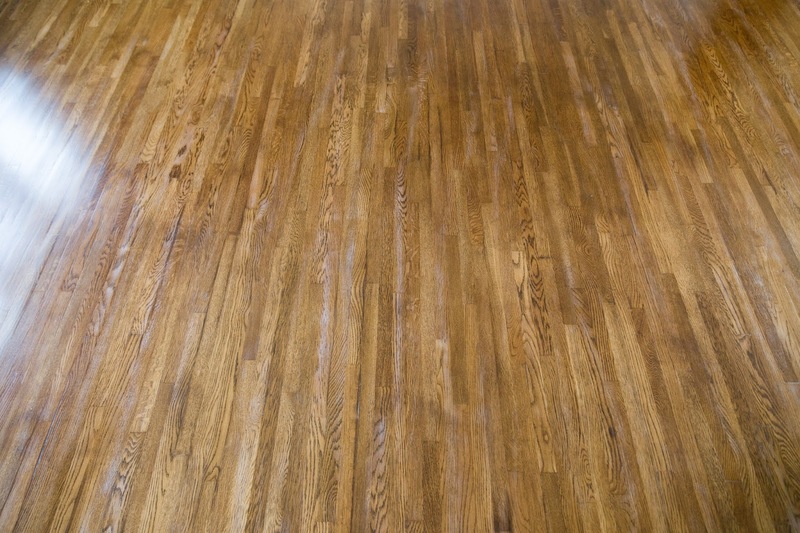 In between each coat, we waited 24 hours then sanded with 220 grit on a pole sander. It looks scary to scuff it so much, but it's totally necessary for proper adhesion. We always use a tack cloth on the Swiffer to get up all the dust. 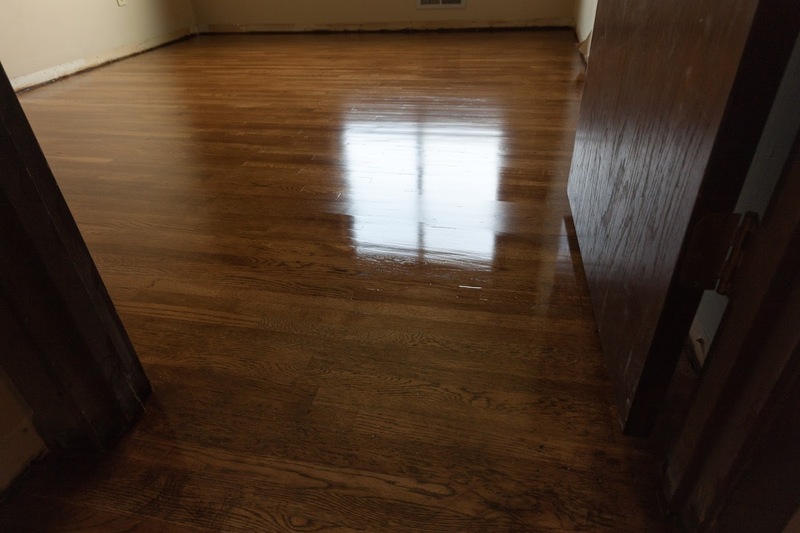 After our fourth coat, we saw that we had some issues. 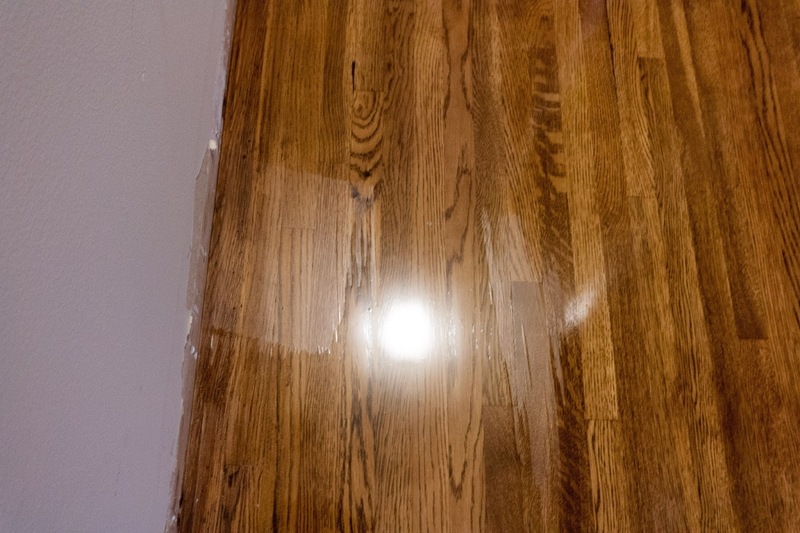 Apparently 24 hours drying time was not enough by the time we got three coats on, because the fourth coat had a lot of what they call 'alligator skin'...caused by the previous coat not being dry enough. This picture also highlights a nice brush hair, Shaun had brushed on the first coat before we switched to the pad. Note to self, don't use cheap stain and poly brushes! Ugh, a really bad drip and some weird skips. 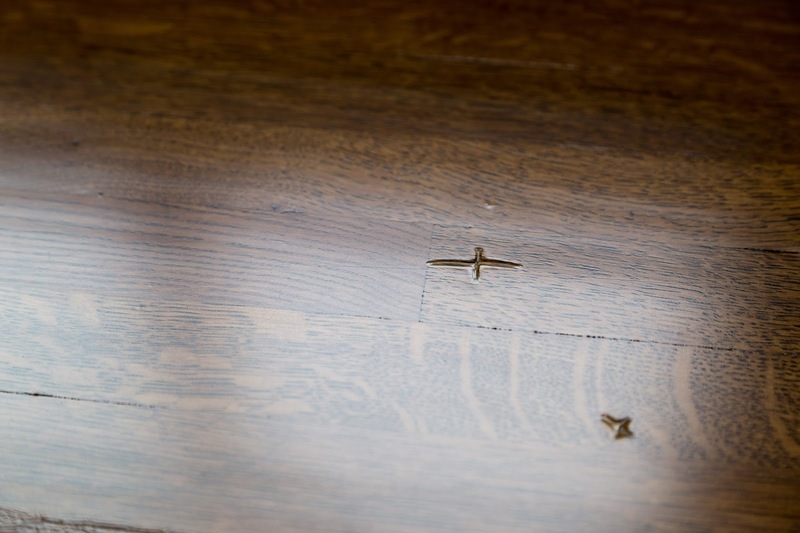 Trapped particles created these little crosses in some areas, I'm assuming the previous coat wasn't dry enough and the new coat couldn't adhere around these little devils. 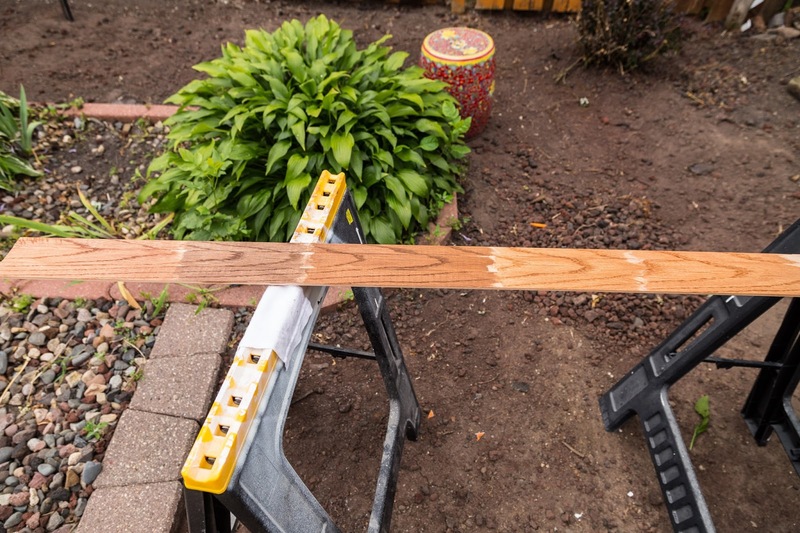 Back to my point about the sub-par wood, when we sanded the steps we realized they were just cheap pine treads. 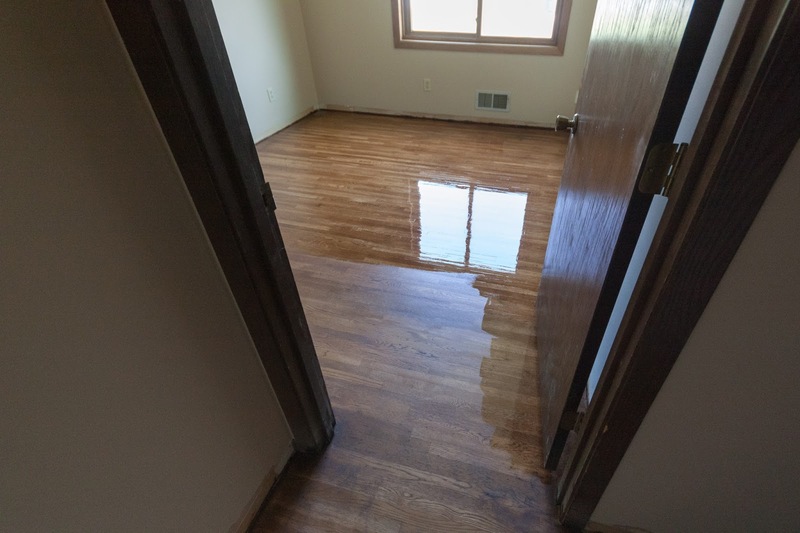 Why they would put oak everywhere and then install pine treads, I have no idea...but we just stained it the same and of course the soft wood came out much darker because I didn't have time to go get (or apply) wood conditioner. Maybe one day we will put in good treads, but for now this is ok. Overall, Ashford's room is the worst with the scaling and I'm just thanking my lucky stars that these floors will mostly be covered by rugs! I am much happier with the way the house looks, though. 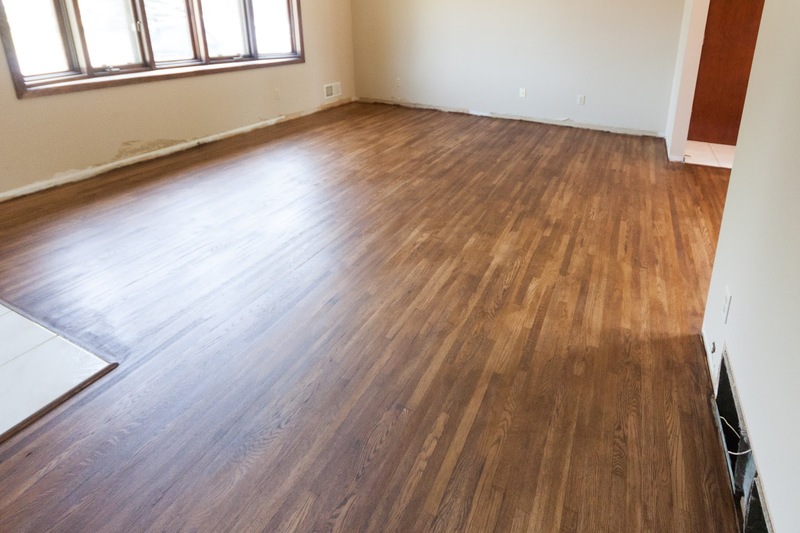 New flooring can make such a huge difference! I love how the floors totally match the window now, I'm not planning to paint any windows in this house. We waited an entire week to replace the furniture, and will wait about four weeks to put down the rugs. I've learned my lesson with the rugs, in our last house I had a grid pattern from the rug pad all over the upstairs even when I waited 3 weeks to replace them! Oil just takes so much longer to cure. One good thing about waiting so long to put back the furniture is Ashford's antics. He just loves running around in there! All in all, we ended up spending $180 on the sander rental, $10 on the paint pad, $10 on tack cloths, $15 on two quarts of stain, $240 on 6, count 'em, 6 gallons of poly. After spending $450 on this project and a week of Shaun's vacation, I'm not sure we made the best choice. I would've rather paid 3k to have someone else do it, frankly. This go around was super stressful, I think I'm losing my mojo sometimes. Oh well, it's done and we're moving on! they really do look great though, and i'm sure when you're not looking for all of the imperfections, you probably won't even notice them. 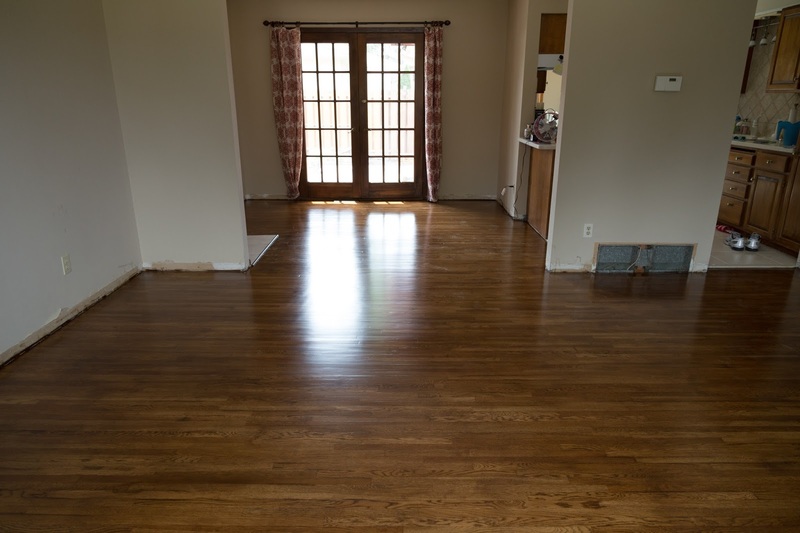 After trying almost every single item in our house ourselves, I'm definitely a lot happier with our job of refinishing hardwood floors than the "pros" we had. But, if we could find a company that did a good job and wasn't crazy expensive, I would gladly hire that out if we had to do it again because it is SO. MUCH. WORK. It looks marvelous with just a few mishaps. BUT...it is done!!!! !pat yourselves on the back. Yippee!! You are my hero!!! As for Ashford...what are you feeding him? He looks about 6 years old. Wasn't he just a baby.....like yesterday? Do you have a To-Do list? Could you do a post on what you want to accomplish in the future? Doesn't need pictures....just 1-2-3! How is the house painting? Idea for another post. Young mom/family moving and the adjustments you have gone through. I think that pits could be hilarious. Keep up your hard work. We love your posts. Can't wait to see the painted exterior. Will be great! 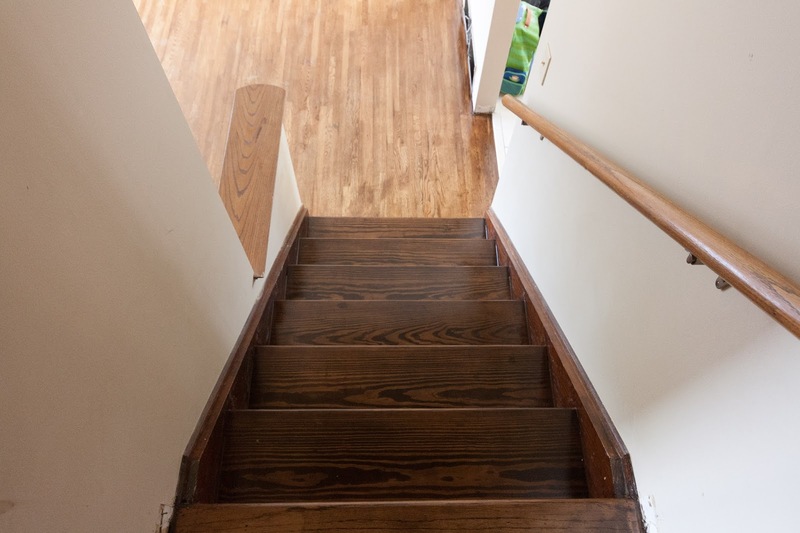 most stairs are done in pine if they are too be carpeted...I have a hair in my floor finish in my family room I know its my hair from my head....it drives me crazy. the new house is looking great. The progress you have made on your house in such a short amount of time makes me feel like a slacker! We have the same issue with the pine stairs - ours were solid oak on the bottom and the top stairs were pine - we figured that it was because the pine stairs were to be carpeted. Eventually, I plan to replace the treads with oak to match the rest - for now, we used veneer on the edges, since we re-carpeted the stairs about the width of a runner.